Hello. Thanks for visiting our blog. Today’s post focuses on missing teeth and bone health. Our teeth have many important functions. We need them to chew our food, talk, and smile. But have you ever considered their role in holding up your face? When we lose teeth, the bone around the site of the extraction begins to shrink. This, in turn, causes our facial muscles to sink in and collapse. We sometimes think of bone as a solid mass, unlike the softer tissues in our body. In reality, below the seemingly rock-hard surface, bone tissue is full of small holes – kind of like a sponge. In the interior bone tissue, the bone is continually regenerating itself. This vital process is sometimes called “bone metabolism.” In the jaw bone, the movements of the teeth stimulate this process of rebuilding. When the tooth is gone, the bone starts to shrink as blood flow is reduced. People with missing teeth not only have an unsightly gap in their smile, they begin to look older because of the bone recession and eventual facial sagging. It is not simply an issue of attractiveness – it poses serious health dangers. It may become difficult to chew food, making it harder to get adequate nutrition. Mental health can also be affected when patients with missing teeth loses confidence in themselves or withdraw from social situations because they are self-conscious about their smile. Modern Phoenix dentistry to the rescue. Dental implant technology provides a tooth restoration solution that maintains healthy bone metabolism while providing near-normal tooth function. For patients missing many (or all) of their teeth, it may not be possible to replace every single tooth with an implant. In many of these cases, dental implants can be used to provide an anchor for a partial denture. 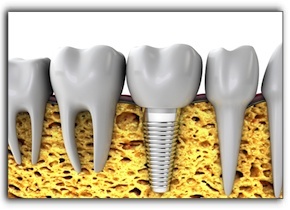 What if your bone has shrunken so much that there is not enough to support an implant? You may be a candidate for bone augmentation or bone grafting. This procedure is routinely handled with success in the Phoenix area and can be done with your own bone, synthetic bone material or bone from a cadaver. If you are missing teeth, don’t resign yourself to dentures. Tooth implants can provide a remarkable smile! Schedule a consultation by calling 480-428-0040 .